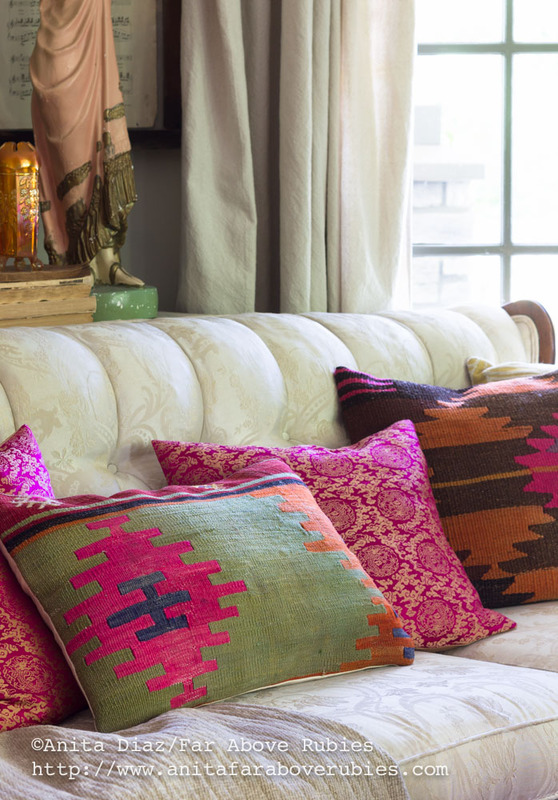 There are so many aspects of Bohemian chic style that appeal to me--from well-traveled accessories, Turkish kilims, and Native American art, to plants, vintage finds, mid-century furniture and my favorite -- color. 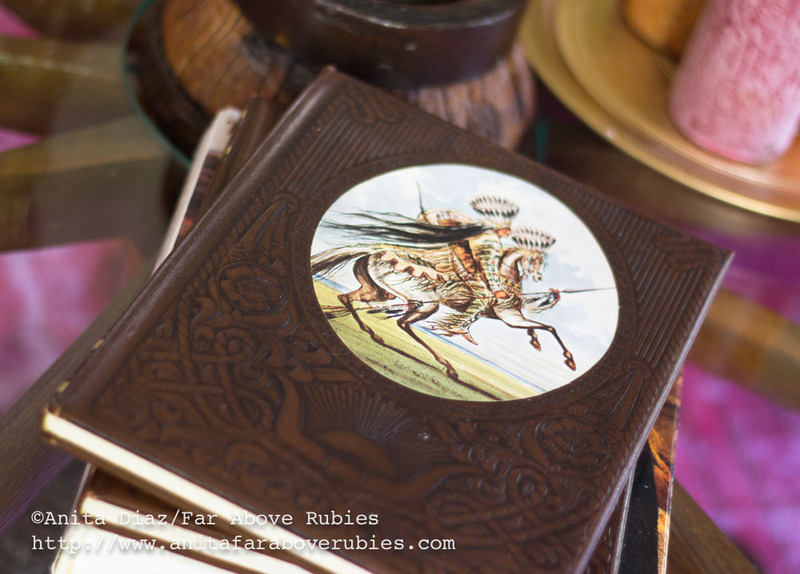 It's kind of like a smorgasbord of all my favorite design elements -- and then some. 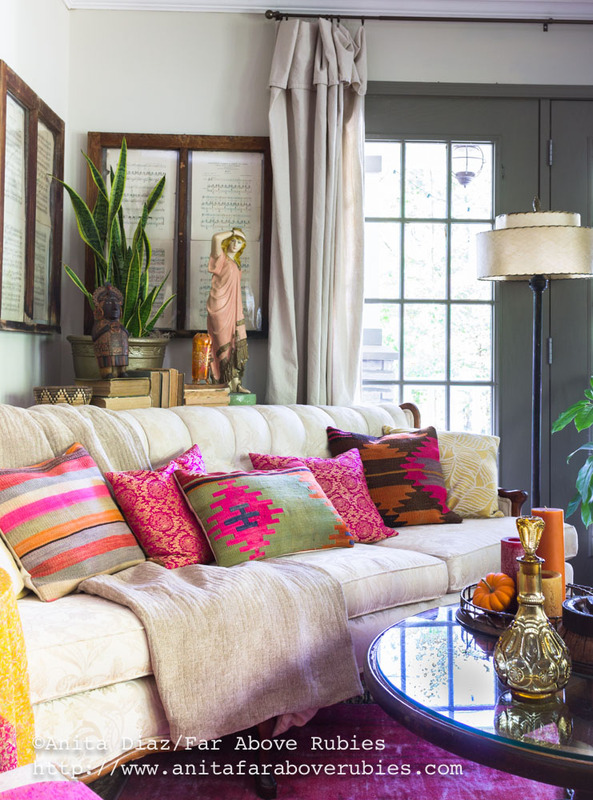 I also think our homes go through an evolutionary process just like design does, so it is perfectly natural to find one's style gravitating toward something fresh and new, and that's where a little sprinkling of Bohemian chic comes in. 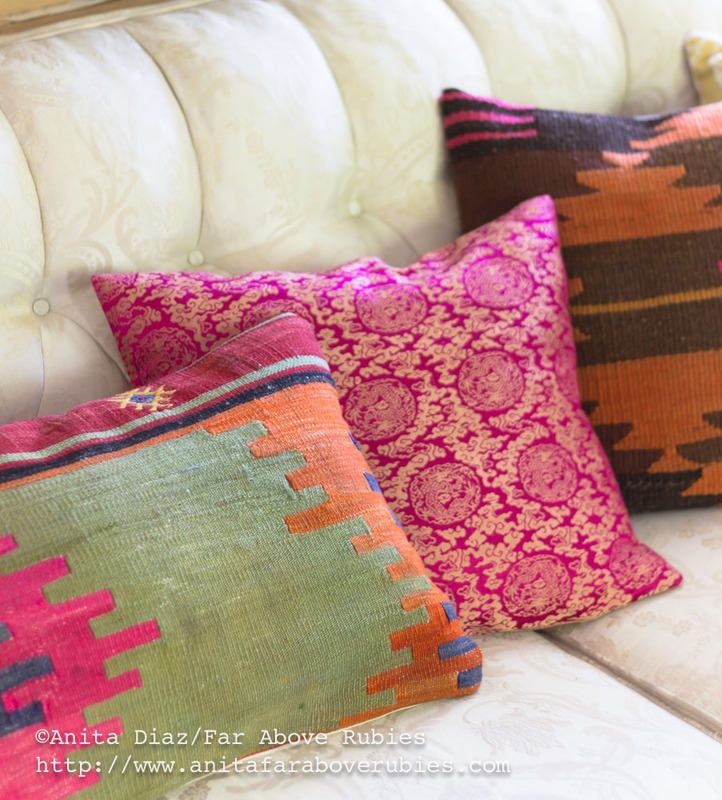 Instead of typical fall fabrics or accessories, I welcomed the season in our living area with colorful Turkish kilim pillows, warm throws, and more Native and South American art. 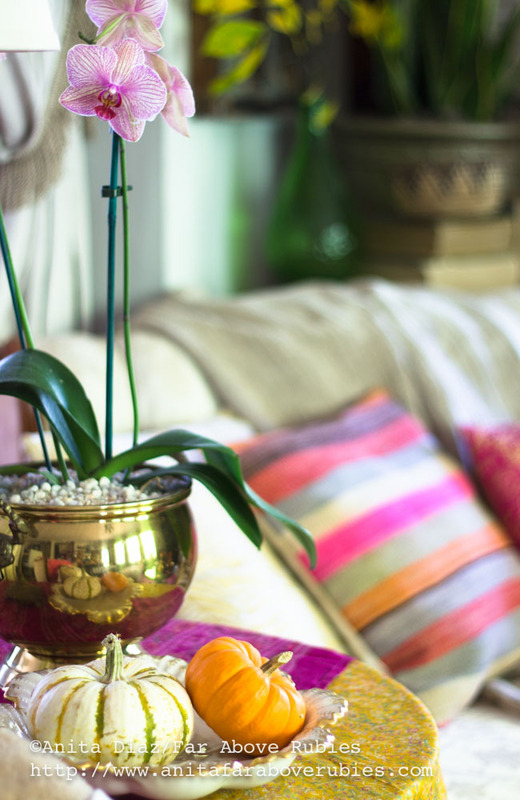 Colorful candles in a brass tray from India also add to the warm seasonal palette without being overtly "fall." As I mentioned in a previous post, all things Native American speak "autumn" to me. Maybe it's from growing up with the Thanksgiving stories and tales of "Indians and Pilgrims" sharing a meal that first Thanksgiving, or the abundance of Cherokee culture here, which seems to really come alive this time of year. Whatever it is, I have always loved it and am enjoying spreading my collection of art, etc., around the house again. 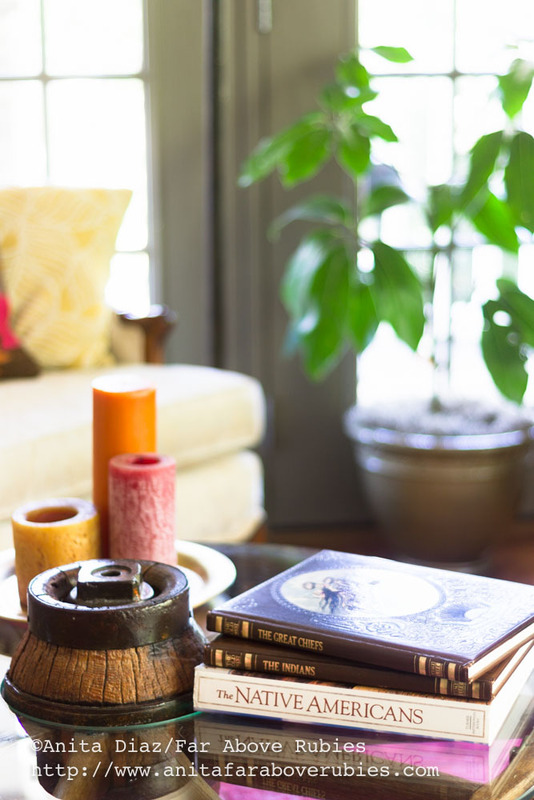 Mix in some mid-century items like this lamp painted by my grandmother, an iridescent carnival glass vase, a sculpture from Bolivia, and the Nisqually Indian basket from Washington state, and the Bohemian style really starts to take shape. 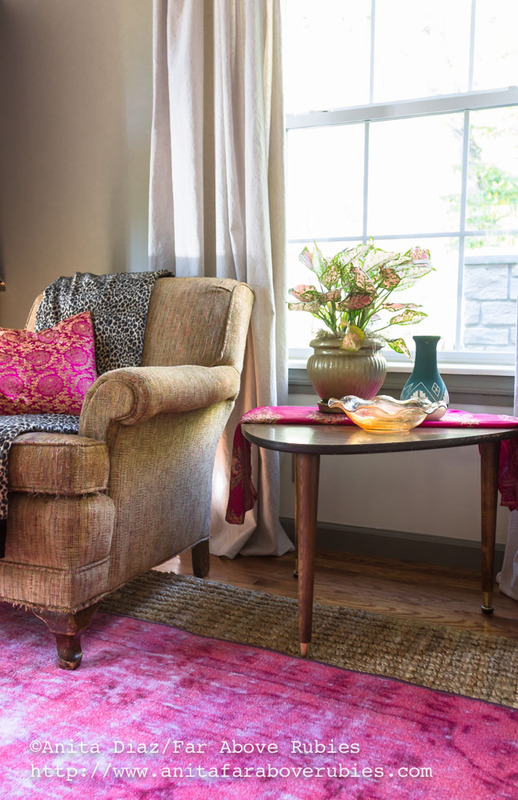 A mid-century whip-stitched fiberglass lamp shade is a favorite of mine, and is paired with an antique floor lamp. This one was a recent find in my parents' attic, and was actually made by my mother. 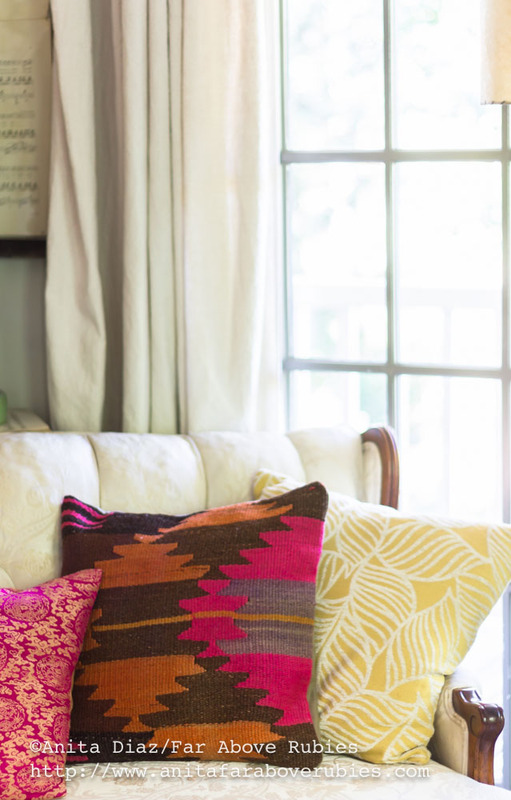 It is large, comfy and warm -- perfect for those cool, fall Sunday afternoons. 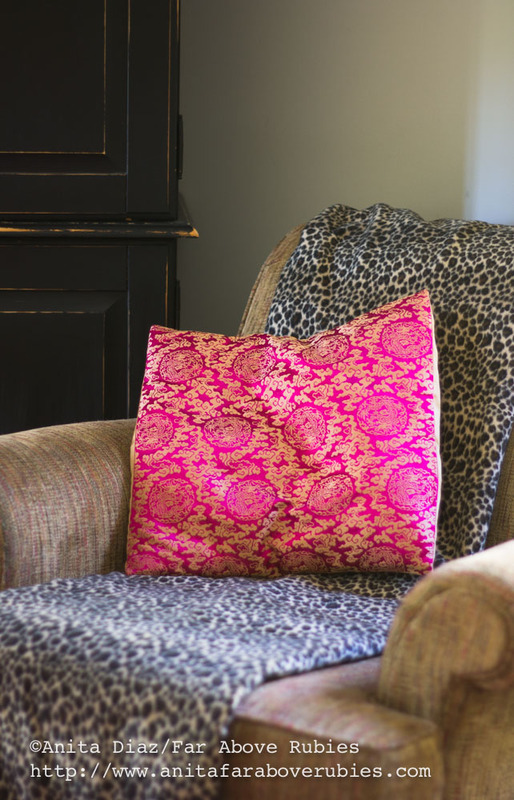 Animal prints seem to go with anything, and paired with the hot pink Chinese silk pillow, this leopard throw brings in yet another aspect of Bohemian style. One of my *favorite* finds recently was this mid-century "guitar pick" table. I remember this table well from my grandmother's house, and it originally had a table lamp attached. My dad had taken the legs off and stored it, so I resurrected it by restaining the legs in dark walnut and cleaning it up a bit. Oddly enough, I had no idea what this kind of table was called until my husband said it looked like a guitar pick. After a little research, I found out the guitarist in the family was actually right. He always is. I've had so many different tables here, but really love the addition of the clean, mid-century lines and style it adds to the mix. 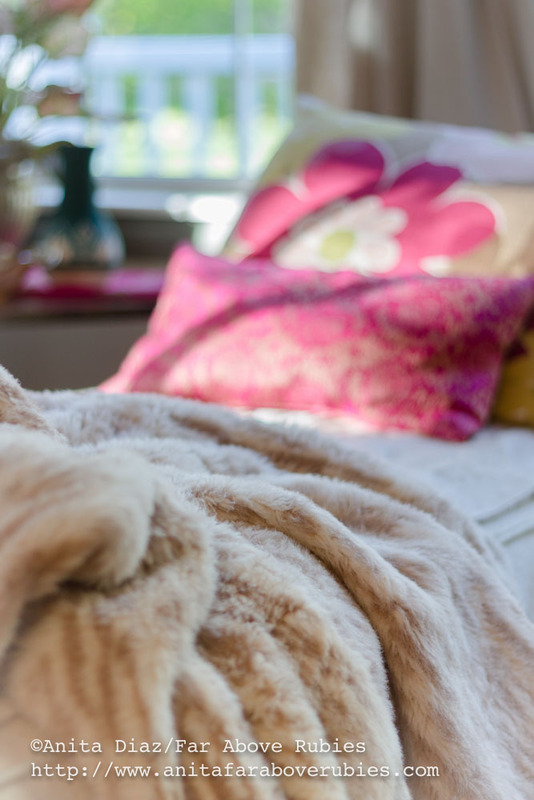 As the weather turns colder, we will naturally be spending more time indoors, so making this space comfy is really important. 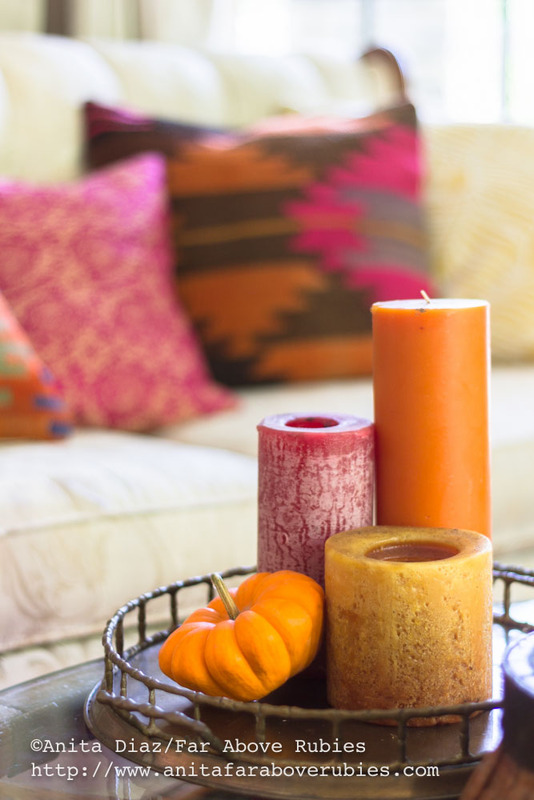 I think we have a warm, inviting room all ready for fall and the holidays ahead. ...but most importantly, a space to enjoy as a family. I know, Sally, I am loving looking around at different versions!! Thanks for stopping by!! You just can't go wrong with leopard Jordyn!! 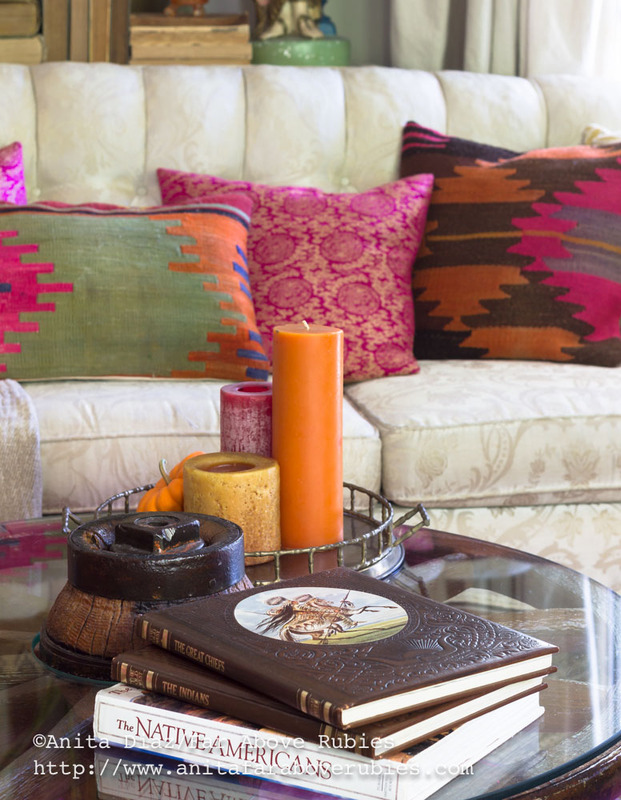 your take on Autumnal colors and style is refreshing! What a beautiful room! 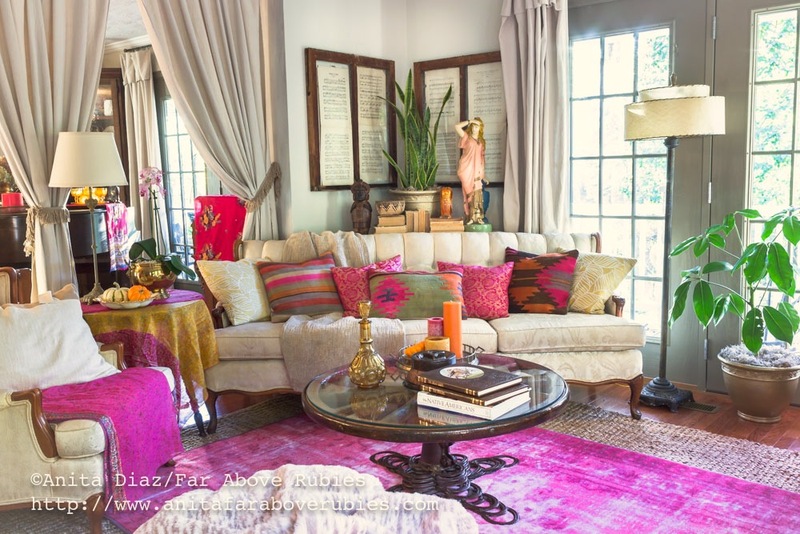 I love all the colors of your boho style. 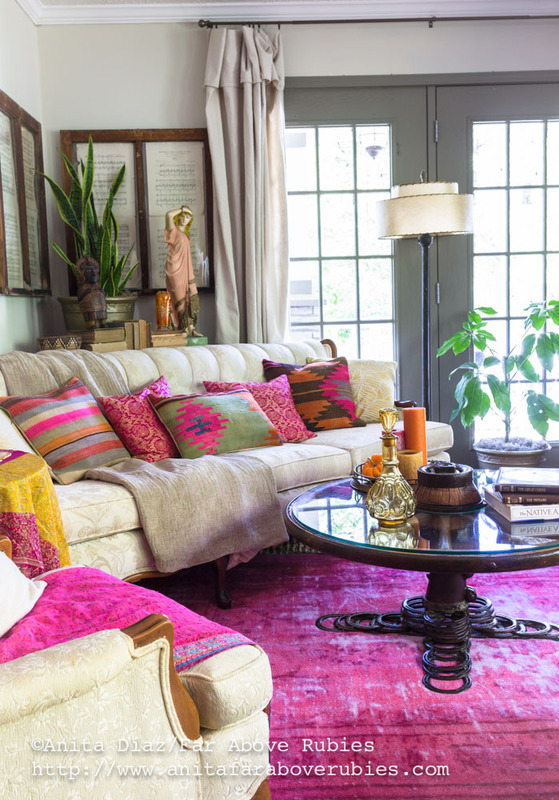 Your living room is beautiful. I love all the brilliant colors! 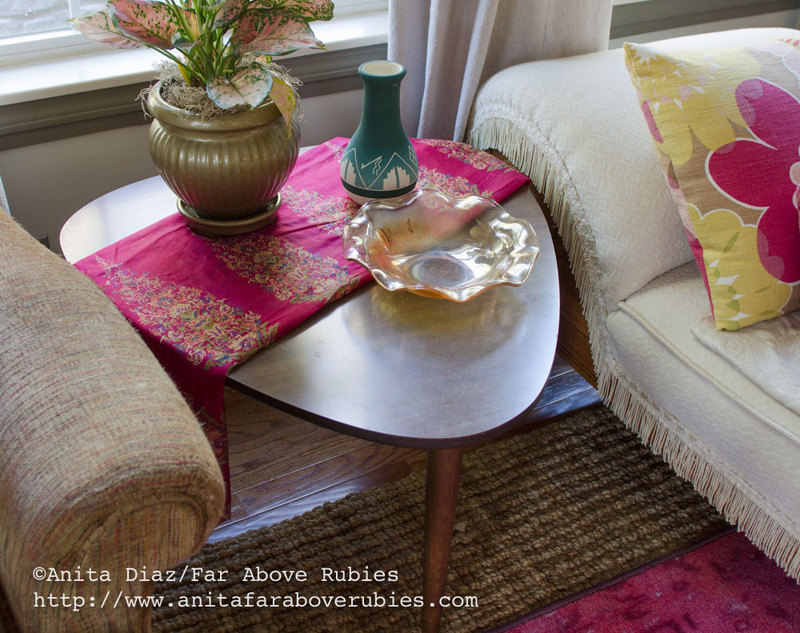 Your style fascinates me, Anita! It always has, from the first time I discovered your blog. I like so much that you change your rooms to something so new and fresh but not by going out and buying all new stuff. And of course because you use so many family or family inspired things passed down, giving them new life.And I fall in love with each new look! 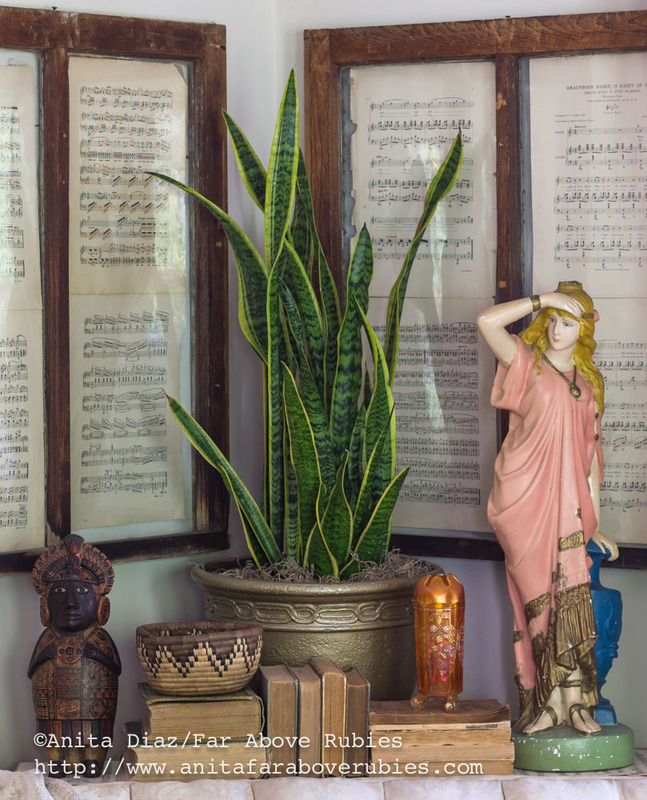 I love your hints for adding some BoHo Chic that are appropriate for this new season, since I'd been wondering how to do that in our house, too. Thanks for the tips!